The audioguide tells the story, describes architecture and reports interesting facts about the basilica of Santa Maria in Domnica, located in Rome, on the summit of Monte Celio. The church is also known as "Santa Maria alla Navicella", because of the ship-shaped sculpture, from the Roman era, located in the piazzetta, in front of the church. Today, this sculpture has been transformed into a fountain. According to the legend, the ship-shaped sculpture was a votive for Isis, the protector of sailors, offered by Egyptian sailors who had come to Rome. It was found near the Colosseum. Particular attention is paid to the decoration of the central apse. They lively colors are striking, especially since many of the mosaics, of the apse, date back to the 9th century and represent work from the Byzantine school. Since the mosaic is in line with Byzantine canons, it is believed that it may be the work of oriental artists who had fled to Rome after the outbreak of iconoclastic politics. 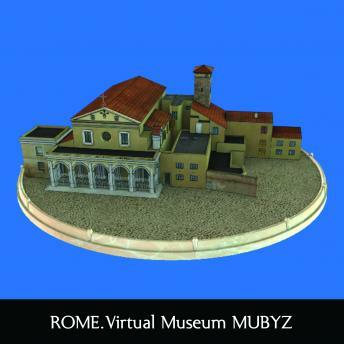 You can examine the 3D model of the church and observe its interior, through the MuByz App. The audioguide has been made by professionals in the field of history and art.